Of note is the fact that al-Maliki is the deputy head of the Islamic Dawa' (Call) Party. 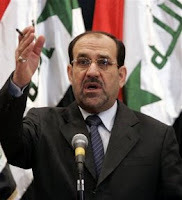 The head of the Party, Ibrahim al-Ja'fari, was al-Maliki's predecessor as prime minister, and the Party's founder was the uncle of Muqtada al-Sadr. There were rumors that just prior to the current "surge" al-Maliki warned al-Sadr to leave the country and to order his militia to lay low. Now we have reports that al-Maliki's office is directly influencing the crackdown on illegal militias by firing commanders who are being too effective in the effort. There is an office in al-Maliki's administration called the "Office of the Commander in Chief," headed by a close ally of al-Maliki. As soon as a military, security force or police commander shows results in going after Shi'a militias, especially the al-Sadr militia, they are removed or marginalized. 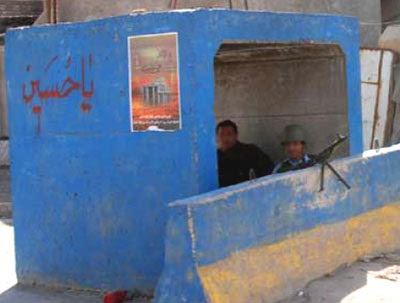 This is typical of the protectionist practices of al-Maliki prior to the recent surge operations. When the American command announced its intention to surge troops beginning in January, one of the key conditions was that al-Maliki had to agree that there would be no meddling when American and Iraqi forces pursued the Mahdi Army and conducted operations in the group's stronghold in the Sadr City section of Baghdad. It would appear that al-Maliki has found a low-key, behind-the-scenes way to impede progress, this time by removing effective Iraqi commanders. Perhaps al-Sadr is not the biggest problem in Iraq - perhaps we need to remove al-Maliki along with al-Sadr. Secretary of Defense of Gates announced Wednesday that he is extending the combat tour length for active duty U.S. Army soldiers from the standard 12 months to 15 months, with the commitment that the period between combat rotations will be 12 months. This announcement does not affect the reserve components of the Army – the Reserves and National Guard – nor does it affect the length of deployment for the U.S. Marines, currently seven months. While that sounds like it will provide more troops for the commanders in Iraq and Afghanistan, in reality many of the troops are extended for that extra three months anyway. In the past, that was the most effective way to plus up the number of troops: maintain the inbound schedule but retain units about to rotate home an extra three months. In effect, this formalizes the longer tour length that has been imposed on many of the soldiers who have served and are serving in Iraq and Afghanistan. The objective is to provide soldiers at least 12 months between combat tours, and at the same time provide higher levels of troops in the region. It’s robbing Peter to pay Paul. It will work in the short term, but at some point, you run out of soldiers. The problem is not the tour length; it’s the fact that we do not have a sufficient number of soldiers – or Marines for that matter – to maintain the scale and pace of operations, the “ops tempo,” currently assigned to the armed forces. Let’s be clear about our armed forces. Plain and simple, the all-volunteer force works. We have fielded the best-trained and best-equipped military in our history. At the end of the Cold War, we drew our forces down to what are now unacceptable levels. The problem is that there are not enough of them. There are proposals to increase the size of the land component, the Army and Marines, by as much as 100,000 troops to supplement the existing 500,000 plus troops. That’s the minimum that is required if we are going to maintain presence in the world’s hot spots – right now that is Iraq and Afghanistan – and be prepared to defend our interests around the world wherever challenged. That challenge might come elsewhere in the Middle East – Iran comes to mind – or in Korea, Taiwan, or the Horn of Africa. We must be ready to act when needed, not worry about raising the required numbers after the crisis presents itself. When we decide that a deployment of U.S. forces is required, we need to send them in numbers that indicate we mean business. We can’t do that now. On at least one occasion in the last year, the Pentagon was forced to deploy the 82nd Airborne Division’s “ready brigade” to Iraq. This is the unit that is supposed to be on call to respond to a crisis anywhere on a moment’s notice. It’s hard to do that when deployed to Iraq. The interests of a nation of 300 million people can hardly be defended by one half of one percent of the population. We spend about four percent of GDP on defense. In today’s world, that’s not enough. The Taliban has just beheaded an Afghan national who had been working as an interpreter for Italian journalist Daniele Mastrogiacomo - the two had been kidnapped a month ago. The journalist was released after the government of Hamid Karzai agreed to release five senior Taliban prisoners in Afghan custody. There are rumors that in addition to the release of the Taliban by Karzai, Italy paid a large ransom as well. This has come home to roost. In late 2006, Italy paid two million dollars for the release of journalist Gabriele Torsello in Afghanistan. Italians overseas are now targets for kidnappers - they know the Italian government will pay ransom. In a likely related event, the Taliban has now seized two French nationals working for a children's relief organization, along with three Afghan nationals on their staff. After seeing the Karzai government accede to similar demands earlier, the kidnappers have demanded that Karzai now release five senior Taliban prisoners. In other areas, there have been kidnappings of Afghan government workers with the expectation that Karzai will exchange more Taliban prisoners for them. Afghanistan and Italy are already sliding down the slippery slope of giving in to terrorists and kidnappers. One Afghan paper proposed a solution I can live with - kill all the Taliban prisoners. The two officers among the 15 British sailors and marines detained for almost two weeks by the Iranians spoke out today about the incident. Their answers, while illustrative and do put to bed some of the speculation about their treatment at the hands of the Iranians, raise more questions. The young officers, one a Royal Navy lieutenant and the other a Royal Marine captain, gave a rather eloquent account of the incident from their perspectives. One commanded the boarding party and the other the navy boats that transported them from the frigate HMS Cornwall to the ship to be inspected. Several things jumped out at me that are at odds with how American forces do things. For example, a Royal Navy helicopter supporting the two-boat boarding party departed while the party was still on the vessel being searched, leaving the British without any covering fire support. The navy officer also explained that the HMS Cornwall was not in a position to provide cover for the operation. This pretty much left them out there alone without the capability to defend themselves against the more heavily armed Iranian gunboats – which were allowed to approach the British boarding party almost two miles inside Iraqi waters. What was the commander of the Cornwall thinking? The Royal Navy will need to review these procedures. After seizing the Britons, the Iranians blindfolded, bound, stripped and isolated them – the exact type of treatment of Al-Qa’idah terrorists and Iraqi insurgents for which the United States military has been severely criticized. The 15 were held for almost two weeks, denied access to British consular officials, threatened with trial and imprisonment, coerced to make “confessions,” and coerced to express gratitude to their captors. They have been criticized by some for being too cooperative with the Iranians. The Royal Navy will have to address that, but it bears much of the responsibility for them being in the predicament in the first place. It is almost impossible to imagine the U.S. Navy allowing their personnel to be placed in a position where they were not supported, and then seized without a fight. Back to the point - let me get this straight. We have the Iranian Islamic Revolutionary Guard Corps send its gunboats over a mile and half into Iraqi waters, detain a Royal Navy boarding party at gunpoint, take them into custody, subject them to psychological abuse, put them on display in a media circus and twisted their release into a show of Iranian magnanimity. Hopefully the world sees this for what it is – an engineered Iranian propaganda stunt. More importantly, where is world outrage at how these young men and woman were treated while being detained by the world’s largest sponsor of terrorism? You know – Iran, the people who brought you Hizballah. Mr. TONY BLAIR: To the Iranian people, I would simply say this. We bear you no ill will. On the contrary, we respect Iran as an ancient civilization, as a nation with a proud and dignified history, and the disagreements that we have with your government, we wish to resolve peacefully through dialogue. All right. Gentlemen, we have Tom Ricks, The Washington Post. We have Rick Francona, former Army colonel who's been fighting all over the world. Lieutenant Colonel RICK FRANCONA, Retired (US Air Force, CNBC Middle East Military Analyst: Air Force. KUDLOW: Let me ask you, gentlemen, in one word for the tease, one word for the tease. In this hostage standoff did Iran win? Rick Francona, yes or no? Lt. Col. FRANCONA: No. No. Tom Ricks, yes or no? Mr. THOMAS RICKS ("Fiasco" Author, Washington Post Military Correspondent): I think so, yeah. KUDLOW: All right. A good split. I was hoping for that. We are going to come right back for an extended discussion. I would reckon the hostages were the big winner now that they're free. KUDLOW & COMPANY coming right back with our military experts, Colonel Rick Francona and The Washington Post columnist Tom Ricks. Be sure to tune in tonight, by the way, at 7 PM Eastern for behind the scenes with the "Mad Money" man himself, Jim Cramer. It's Jim like you've never seen him before. All-access all the time. Behind the scenes, Jim Cramer tonight at 7, only on CNBC. KUDLOW & COMPANY coming right back. President GEORGE W. BUSH: A narrow majority in the Congress passed legislation they knew all along I would not accept. Their bills impose an artificial deadline for withdrawal from Iraq. Their bills substitute the judgment of Washington politicians for the judgment of our military commanders. Their bills add billions of dollars in pork-barrel spending. KUDLOW: All right. There you have it. President Bush back on the warpath. Joining us now is Rick Francona, retired US Air Force lieutenant colonel, CNBC military analyst. By the way, he served in Lebanon, Syria and Iraq. We also have Thomas Ricks, columnist for The Washington Post and author of the remarkable book, "Fiasco, The American Military Adventure in Iraq." Rick Francona, I made a little list because I want to challenge you just on the Iranian thing. OK? So here is the Iranian story. They seized hostages, they went into Iraqi waters, they violated the Geneva Conventions, they coerced the hostages into phony confessions. Now they're being portrayed as magnanimous. And on top of all that, they made a ton of money on the higher oil prices. You going to tell me Iran lost? Lt. Col. FRANCONA: I think they lost politically. They may have made some money on this, but I think the world sees this for what it is. Larry, they engineered this whole thing. I think the IRGC was overaggressive. They went into Iraqi waters, they took these guys, they held them hostage. And these--all these confessions. The only people that would have believed that that was true were maybe some people in Iran. I think that this is a net political loss. And Ahmadinejad used the occasion of the prophet's birthday today to give them the only face-saving way out of this. I think they're lucky they're out of it as they are, but I think, all in all, they lose. KUDLOW: All right. I'd like to know that Rick is right, Tom Ricks, but I'm not sure because after all, here's Iran. Now they're busting the UN resolutions. They're still weaponizing their nuclear. They're testing and so forth. Then they're still helping Hezbollah and Hamas. They're still putting plenty of their secret guards, their provisional guards into Iraq, killing American soldiers and fomenting mischief. I just don't see Iran paying any penalty or cost right now or in the weeks leading up to this episode. Mr. RICKS: I like the list you put to Colonel Francona. I would add one more thing to it. They have sent a message, and a very strategic message it is, that people who make trouble for them in Iraq can expect that they will make trouble for these people elsewhere. So if they don't like what the British and Americans are doing to their people inside Iraq, they have shown that they have a means of responding. KUDLOW: Rick Francona, your response to that, because again I--my problem with this, I'm not here to boost Iran. I can't stand Iran. They're a rogue state for heaven's sakes. But what I don't see is them paying any cost, consequences or penalties for all of the things they're doing. The Iraqi mischief, the Hezbollah mischief, now the hostage mischief, now the centrifuge testing, nuclear development mischief. That's my problem with this, Rick. Lt. Col. FRANCONA: Well, that's what I see here. If you take this one incident, they have to be made to pay a price. Unfortunately, I think you're right they will not be made to pay a price. And I--that is probably one of the things that the British agreed to to get these detainees released. And that was `After this is over, we don't want to have to go to the UN or explain this. It's just going to go away.' But I think someone needs to hold Iran accountable. And the United Nations was trying to do that. But these sanctions just aren't doing it. This incident may galvanize maybe some Russian or Chinese support in the UN. Maybe I'm being too optimistic, Larry. KUDLOW: Just a quickie, Rick, before I come back to Tom Ricks, as a military analyst and as a former strategist, what price would you like to see Iran pay? Lt. Col. FRANCONA: Well, I'd like to see the Security Council take some real action, put some teeth into these sanctions and say, `OK, obviously these sanctions are not working.' And I think now after we've seen what they've done, they revert to the same thing they've always done. The did it in Lebanon. They did it against the Americans. They take hostages. If we can get the UN to do some stronger sanctions, they might pay a price. KUDLOW: All right. Tom Ricks, a quick one on that and then I want to go to Iraq. Mr. RICKS: Sure. I think that--I was thinking about what a British analyst said to me that the only outfit he's seen that was worse calculating and more miscalculating than the Bush administration on Iraq was the Iranian foreign ministry. So I think the price they may pay eventually is they are pulling tigers by the tail and they may overplay their hand. KUDLOW: Gentlemen, we've just got two minutes. I want to ask you, Tom Ricks. General Barry McCaffrey just came back from a mission in Iraq. He says--he says that `The General Petraeus strategy is sound and the situation is not hopeless.' Do you agree with that assessment? Mr. RICKS: Well, I read General McCaffrey's assessment. It was kind of a schizophrenic assessment. Very pessimistic on the one hand, very optimistic in its conclusions. I asked him about that. And he said, yeah, he wrote the first part with his head. He wrote the second part with his heart. KUDLOW: And would you agree with him it's not hopeless? Mr. RICKS: It's not hopeless, but anybody who tells you the surge is working must know something that General Petraeus doesn't know because General Petraeus today said it's too early to tell. KUDLOW: Mmm, interesting. All right. Rick Francona, a quick response on the McCaffrey, and then I want to talk about al-Qaeda's new threat. First, is it hopeless over there in Iraq, Rick? Lt. Col. FRANCONA: No, it's not hopeless, but I think Tom was exactly right. Following General Petraeus' reasoning, it's too early to tell. I mean, if you put two brigades, two American brigades, three Iraqi brigades on the ground, of course, you're going to see some improvement. But I think, we don't know if this is a permanent improvement if we're successfully buying enough time to get Iraqi forces in there. Otherwise, we're just pushing this problem out into the future. KUDLOW: Last minute, New York Times lead story a couple days ago. We've been following this story on this program. The resurgence of the al-Qaeda's leadership and operations in the Pakistani badlands and Afghanistan. Rick, do you agree or disagree with The New York Times? Lt. Col. FRANCONA: I agree that they've reconstituted themselves up on the Pakistani side of that border, but how effective they can be up there I really don't know. They're not operating before as they were before when they owned their own country. Now they're up in the caves hiding over there. They may have reconstituted their structure, but I don't think they've reconstituted themselves as the major threat that they once were. KUDLOW: Tom Ricks, we just got 15, 20 seconds, agree or disagree with al-Qaeda resurgence a la New York Times. Mr. RICKS: ...but they've come back and regenerated, and that's a worrisome sign. KUDLOW: All right. Colonel Rick Francona, Tom Ricks of The Washington Post, gentlemen, thank you ever so much. Up next, my last word, I want to see these Republican candidates be sharp as a tack and very specific because we're for keeping America great. KUDLOW & COMPANY coming right back for the last word. The Iranians have decided to release the 15 British sailors and Marines they have held hostage for over 12 days. Iranian President Mahmoud Ahmadinejad announced that he had “pardoned” the British during the celebration of the birth of the prophet, which this year almost coincides with Easter. To the world, he appears to have made a magnanimous gesture. Good news, of course, but now comes the post mortem. There are many questions to be answered, not the least of which are what did the British give to secure the release of their service members, and will Iran pay a price for their action? Most of the world believes the British were operating in Iraqi waters and this whole affair was engineered by the Iranians to draw attention from its nuclear program. Inside Iran, the affair may have played well - distrust of the British is an ingrained emotion. It was Britain, after all, that granted Iraq total sovereignty over the Shatt al-Arab when they created the country in the aftermath of World War One. It is that same body of water that sparked decades of disputes between Iran and Iraq, including 1980-1988 Iran-Iraq War. 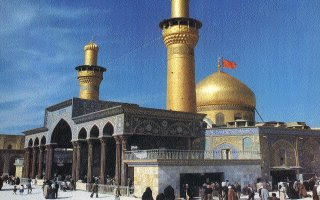 It is also the venue of the current Iranian action against the British anti-smuggling team. The current border in the waterway is the thalweg, the deepest part of the channel, not always easy to define – confrontations are probably unavoidable. So what did the British give to secure the release of their service members? The Royal Navy has always maintained that their naval units were operating inside Iraqi territorial waters, and it appears that stance has not changed. That said, several of the 15 Britons did make “confessions” on Iranian television. I suspect they will be called on to explain that decision. It’s a tough call for a detainee to make – do I go on television and perform as demanded to prevent mistreatment of my subordinates, do I appear to send a message to my government and family that I am alive and well, or refuse to comply and suffer the consequences? I am sure the Royal Navy will ask. Probably more important in the long run, what price does Iran pay? In recent days, some commentators believe Iran will emerge from this situation as the winner. How can that be? They precipitated the crisis. The immediate reaction to the “pardon” and release is that the Iranians are the good guys in this. I hope not. Ahmadinejad found a face-saving way out of a mess he created – nothing more. The Iranians need to be held accountable for this charade. They probably won’t. That may be in fact the British accommodation.